Turns out Joffrey stuck the former President's head on a spike in season one. Whoops? In the mythical land of Westeros, daily survival is something of an achievement. The ways in which the land can kill you are myriad, with the latest scourge to organic life being the ruthless rule of the esteemed King Joffrey. Joffrey has a thing for getting seriously annoyed with his citizens and then shoving their heads on spikes without really thinking about it - including the head of, it has now been revealed, former President of the United States George W. Bush. This slightly spoilery season one screencap shows the final resting place of the President, lined up for show with other recent decapitatees. 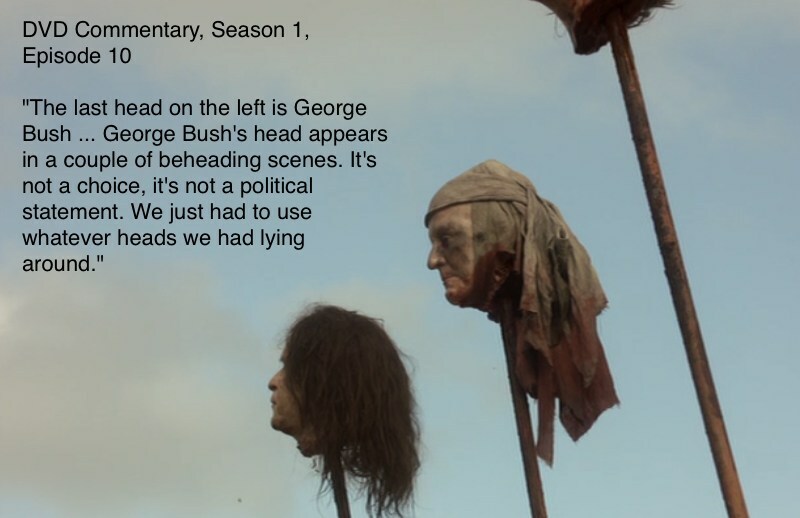 The inclusion of the President was incidentally revealed in the DVD commentary of season one (as spotted by redditor SidIncognito), where show creators David Benioff and D. B. Weiss helpfully point out that that "the last head on the left" in the line of spike-mounted heads is that of "George Bush." 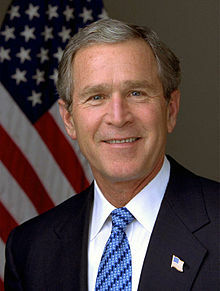 "George Bush's head appears in a couple of beheading scenes," they explain. "It's not a choice, it's not a political statement. We just had to use whatever head we had around." Naturally, some onlookers were less than pleased with the unexpected cameo. In a quick response to the news that one of its flagship productions had knowingly used a President's prosthetic severed head as a prop, HBO said that, "We were deeply dismayed to see this and find it unacceptable, disrespectful and in very bad taste. We made this clear to the executive producers of the series who apologized immediately for this inadvertent careless mistake. We are sorry this happened and will have it removed from any future DVD production." Benioff and Weiss also apologized for the head. "What happened was this: we use a lot of prosthetic body parts on the show: heads, arms, etc. We can't afford to have these all made from scratch, especially in scenes where we need a lot of them," they said in a statement. "In the DVD commentary, we mentioned this, though we should not have. We meant no disrespect to the former President and apologize if anything we said or did suggested otherwise." By the looks of things, the producers will try to avoid including President Bush in any future episodes. As for those already filmed, I wonder if they used the head anywhere else? As the President himself might have added, "Decapitate and mount my fake head once, shame on you. Decapitate and mount my fake head twice, well..."